Puerto Iguazu is a border town that would be just a dusty backwater if Iguazu Falls were not down the road. The international borders of Paraguay, Brazil and Argentina meet at the Rio Iguazu only a few miles north of town. 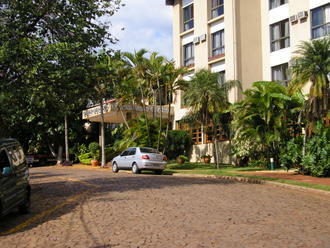 Puerto Iguazu itself does not offer a traveler any reason to stay. There are no museums, only a few decent restaurants but there are a few hotels and night-time clubs. The city is doing infrastructure projects that will help the tourist industry and it is the base to explore the jungle environment of the upper Rio Parana and Iguazu. I have stayed in many hostels since 1970 including quite a number in Argentina. Argentine hostels are certainly not the basic accommodations of my student days and Hostel Inn Iguazu is definitely not your average Argentine hostel - it’s a resort hostel. 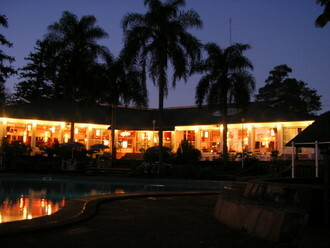 Located several miles outside Puerto Iguazu on Route 12, the building was originally a casino. The long white façade faced with floor to ceiling sliding glass walls looks out onto a sparkling swimming pool, comfortable multi layered seating areas, a covered outdoor bar and lush, landscaped tropical gardens. Inside the lobby/restaurant/lounge whirling fans dot the ceiling, a 24-hour bar dominates the restaurant seating space, a bank of computers line one wall, ping pong, pool and foosball tables along with a lounge of couches occupy another large space. An adequate, but not keep the cleanest, guest kitchen, along with a separate TV room, are in their own area. The young, friendly staff - which includes a Marcopolo travel desk - are always available. The real treat are the double and triple private ensuite rooms - about half the hostel room total. Our corner room had glass picture windows that opened and looked out onto the jungle beyond. 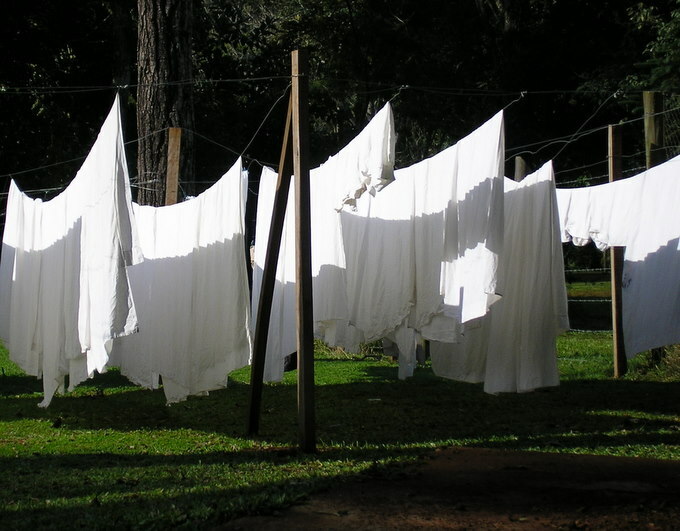 The bed and bath were hotel quality and the hostel provided daily room service. 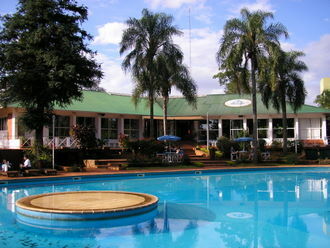 Owned by Marcopolo Group, a major Argentine tour company, and associated with Hostel International, Hotel Inn Iguazu does operate a cafe with lunch, snacks and dinner. A modest buffet breakfast of breads, jams, cereal and fresh fruit was included in the rate and for a couple pesos you could order eggs. Lunch is available from the restaurant - sandwiches, burgers, etc. for very reasonable prices. 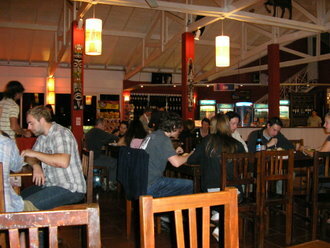 But the second treat were the buffet dinners every night for AR$20 - 30 (US$5.25 - 8.00). Several types of fresh salads, fresh vegetables, rice dishes, potato dishes, breads and, usually, fresh poultry and beef grilled on their own parilla, plus beverage. A bottle of good wine was AR$12 (US$3.20) or a quart of beer for AR$6 (US$1.60) were always available at the 24-hour bar. 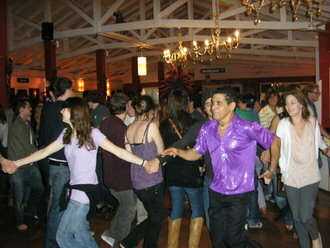 On two of the four nights we stayed at Hostel Inn Iguazu there was after dinner entertainment - a Brazilian samba and a tango group. The hostel attracts a large number of students and 20-something’s, but there was a good representation of travelers of all ages. 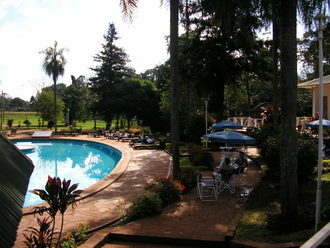 I have only two reservations about Hostel Inn Iguazu. Due to its young clientele, music plays in the lobby and outside pool area from 8:00 AM through midnight, increasing in decibel level during the day. After 5:00 PM it is quite deafening for people not use to having MP3 players continually plugged into their ears. Fortunately, the hallways to the rooms and the rooms themselves seem to be soundproofed. The second issue is that on a couple occasions the 24-hour bar resulted in very loud behavior around 3:00 AM which did disturb sleep when the people involved were outside - or in the room next door. The staff needs to enforce their quiet rules. But, these two issues will not prevent me from highly recommending Hostel Inn Iguazu nor prevent me from returning in the future. 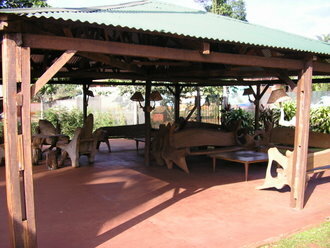 The beautiful private double room with full bath cost AR$150 per room (US$40.00). Free Wi-Fi connection is available in the public areas. Dorm rooms, sleeping four to six, make up half the rooms and cost AR$39 (US$10.40) per bed. Unfortunately the hostel does not accept families with children under the age of 18, but there are many accommodations along Route 12 where a family can stay for under US$80 per night. 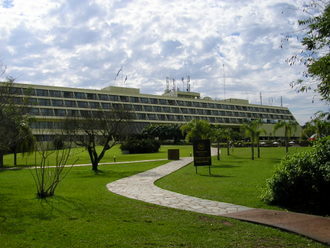 Sheraton Iguazú Resort & Spa, Parque Nacional Iguazu . I did not stay at the Sheraton, although I did walk around the grounds, into the lobby and talked to people I know, and met, who have been guests. The Sheraton is not an architectural beauty but provides all the amenities for which this upscale chain is known. 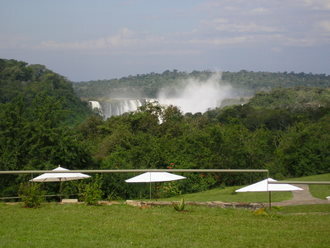 Its calling card: it is within sight of several of the falls and is within the park. When the park closes at 8:00 PM, guests are not allowed to enter the trails, but from your balcony or the pool, you can experience the profound absence of mechanical noise and enjoy the night sounds of jungle and the falls with the air perfumed by the flora. In the morning the entire national park is your front yard. For the traveler who wants to be supremely pampered, the Sheraton provides all with rates from AR$1,384-$2,543 (US$369-$678) per night. El Quincho del Tio Querido restaurant is set in an attractively decorated, dark wooden building on a side street in Puerto Iquazu surrounded by a tropical garden. The outdoor parilla grill, with its chefs, is to your left as you walk through the entrance patio. The interior wood is set off with splashes of color on the tablecloths. 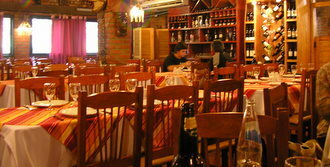 The menu is traditional Argentine parilla and pastas, but this being Mesopotamia, fresh fish grilled, steamed or baked, with sauces, takes equal billing. 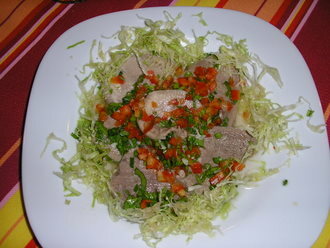 I started with tender slices of marinated beef tongue on a bed of shredded lettuce. My wife and I both had a large fillet of grilled fresh Surubi, well seasoned, with simple steamed potatoes and fresh steamed vegetables. Lunch for 2 - AR$93 (US$25.00). A decent wine list was priced between AR$20-40 (US$5.25-10.50).